Only a Canadian would be obsessed with blizzard videos, hey? 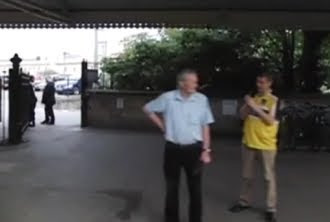 Here is a video that has been making the rounds on the net. 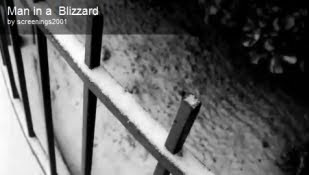 It's a short made up of footage from the blizzard of 26 Dec 2010 in NY. I believe this video was taken in Belmar NJ on 26 Dec 2010. Belmar is about 50km south of New York City as the crow flies. That's a lot of snow. 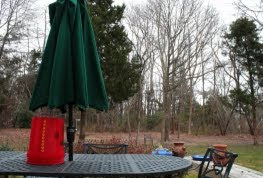 The picture is what the scene looked like before the shi..... snow hit the fan. Or..... how to start a nerd argument. This could change world travel forever. The app is free, the dictionaries cost money. 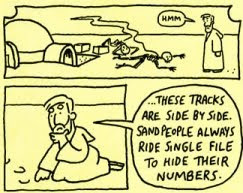 The story of the nativity, internets-style! "You're gonna need more than a supervisor..."
When your front end loader is stuck in the snow, what's a little collateral damage? The question is, will someone lose their job over this video? Will 2 people lose their jobs? Around 1600, the fork was such a new and fashionable utensil that only the merchant and upper classes were using them. It was proper for a guest to arrive with his own fork (and spoon) enclosed in a box called a cadena. In England at that time, the fork was viewed as an 'unmanly Italian affectation'. Some Roman Catholics expressly disapproved of its use, seeing it as "excessive delicacy". "God in his wisdom has provided man with natural forks — his fingers. 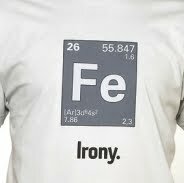 Therefore it is an insult to Him to substitute artificial metallic forks for them when eating." The fork didn't become commonly used in Great Britain until the 18th century. 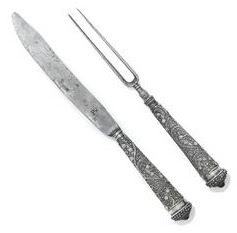 Pictured is a 17th century Scandinavian silver filigree knife and fork set. 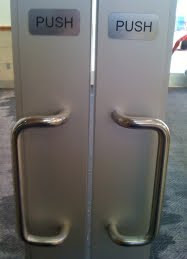 The handles, like the ones seen on this door, should only be on the 'pull' side of the door. The correct hardware for the 'push' side of the door is the plain old flat plate. Can someone please explain this to door manufacturers and building developers so that we don't have people trying to pull on the push side of the door? One of the more interesting articles I've read lately. Or, what happens when you adapt the roadrunner cartoon into real life. As you know, I have a playlist affixed to my blog - over there on the right side of the page. I rotate what music is in that playlist from time to time. This week, I wanted to feature Beatles songs, but alas, Grooveshark (the folks who host the music) have been utterly stripped of anything 'by' the Beatles. Which leaves....... nothing but covers. William James, a psychologist in the 1800s, once metaphorically used the idea of 10% of the brain being all that was used at one time. This grew into the rumour that we only use 10% of the brain overall and most of the rest was not understood or used as far as we knew. 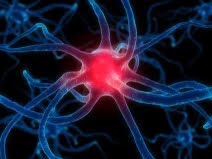 Actually, the inactive neurons are just as important at any given moment as the ones actively firing at a point in time, and the 10% comes from varying areas at different times. We do in fact use all of our brain. [Names and specifics left out to protect their privacy] A very well to do neighbourhood in Calgary has an association. This association has a Christmas party every year. This year, like most others, they invited children from a home in the area. This home is a facility for children who, for whatever reason, do not have a regular family they can live with at this time. Anyway, the party had prizes to give away to participants of the event. Ten of those prizes were huge baskets of gifts for kids. We're talking some sweet gifts people. So two of those gift baskets were won by children from the special home. These are kids who weren't even invited by their original families to spend Christmas at home. Troubled kids they are, but the home insists that families at least take them back into their homes for this one special day per year. In many cases the birth parents refuse this simple request. So, with that in mind, it's not hard to imagine that the kids who won the gift baskets were so thrilled that they actually had presents, they cried. After all, it is very likely that under the circumstances, these kids might not get anything at all for Christmas. What happened next was pure joy. One of the other eight children who won the remaining gift baskets, seeing the reaction of the unfortunate kids from the home who won a prize, decided right then to donate his prize to another kid from the home who did not win anything. This prompted the rest of the kids, all from wealthy families by most standards, to donate their prizes as well - on their own accord. At the end of the evening, every child from the home went home with gifts. And they were beaming. 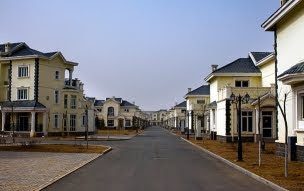 You really need to check out Time's piece on Ordos, the ghost city in Inner Mongolia. A city built for 1 million people, but the people never came. The pictures are surreal. First, I hear pro-biotic yogurt doesn't improve my digestive system. Now I'm told Echinacea doesn't help with colds. Next, they'll be telling me that Bailey's doesn't do anything for headaches. Hands down the best superhero of the year. 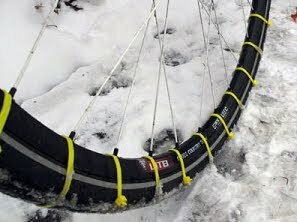 If you absolutely, positively have to ride your bicycle in the winter (on snowy, icy streets), I think this little mod to your bike tires is very MacGyver. Yes..... those are zip ties. You might not want to watch this if you suffer from vertigo or are scared of heights. 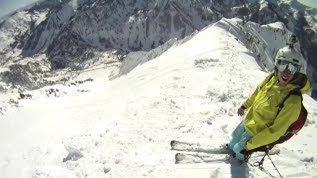 Otherwise, this is a crazy cool video of guys parachuting skiing down Mount Superior in Utah. Don't let a zombie apocalypse ruin your holiday season. I found a very tasty fruitcake at Costco the other day. They were giving out samples, which I have to say is the best marketing strategy ever. I bought it pronto (the accompanying picture is NOT said fruitcake). I actually like (good quality) fruitcake. It probably stems from my childhood. You see, I used to eye the fruitcake other friends and family gave us as gifts when I was young. It would most often get put away in the pantry, never to see the light of day again. Although other family members forgot about its existence (at least temporarily), I most certainly did not. I always knew the status of the fruitcake. 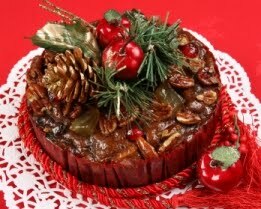 I made a conscious decision most years to clandestinely get at the fruitcake, especially long after the holidays were over, when I figured the cake was a distant memory. It was my secret treat. Most of the fruitcake in our house ended up in me. My mother had not really forgotten about the fruitcake though. So when she noticed it was missing, the gig was up. 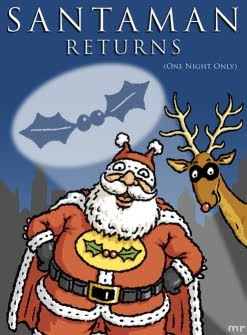 The fruitcake thief was unmasked. But it was worth it. When Kevin Bacon plays a fan of Kevin Bacon, is that the ultimate in narcissism? The best part of this video is when he does an impression of himself doing an impression of himself. 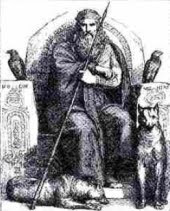 Do you know the history behind Santa? The history of Santa Claus. Up to date on burn rates of all deciduous and coniferous tree types. Expert lumberjack shirt sleeve rolling technique. Certified in damp wood smoke control. Chopped wood at summer camp for 6 years in a row. Built fires in back yard since I was 4 years old. Have had wood burning fireplace in 7 of last 9 homes. Have built log piles in both clockwise and counter-clockwise methods. Created words with log pieces to see if anyone would notice. Hand crafted my own set of fireplace tools, including a forged steel poker. 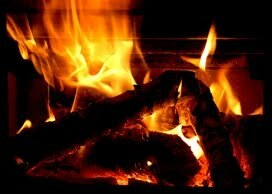 Specialities include log scenting, hot coal stirring and cinder-less log tossing. Pictured is the latest failed wood fire I managed to save from total ruin through strategic poking and fresh log placement. For anyone who has seen the CN tower in Toronto, it's pretty freaking tall. Even amongst a collection of fairly impressive skyscrapers in downtown Toronto, it stands out. 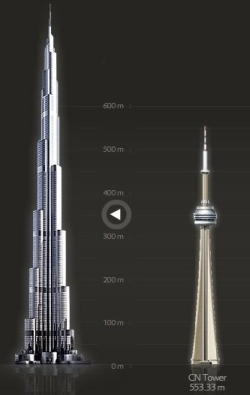 Check out how much taller the livable Burj Khalifa (Dubai) is. Now that's impressive. Here's what's happening to your internet, USA. I hope you can stop it. Because if you can't there's no hope in hell we'll be able to in Canada. 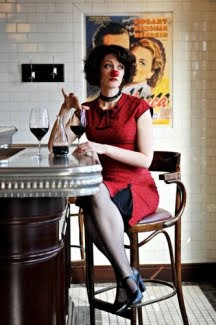 Rebecca Northan took the Blind Date improv show to Broadway this month and... well, read the article to see how well it went over. A friend from Loose Moose created a new profile pic for her Facebook page. Isn't it brilliant? 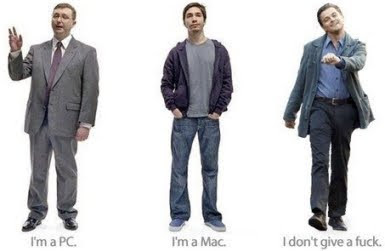 PC vs Mac vs ??? I just had to post this. Found on my friend Dave Ware's FB feed. "Authorities tell ABC News the incident (someone got a loaded .40 caliber gun through airport security by accident) is not uncommon, but how often it occurs is a closely guarded government secret. Experts say every year since the September 11 attacks, federal agencies have conducted random, covert tests of airport security. 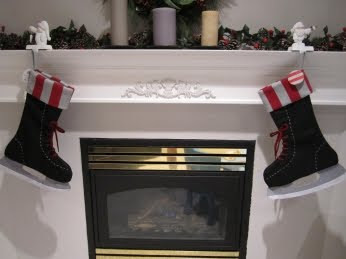 Darlene was looking for something unique for stockings this year. I think she found them. Who wants to smell bacon? Short of whipping out a skillet and doing a quick fry-up, how can we enjoy that wonderful meaty sweet and smoky aroma without the temptation and subsequent belt-busting and heart-clogging richness of actual cured-pork ingestion? Bacon scented candles, of course! These premium scented candles are long-lasting and made from actual rendered bacon fat using a top-secret process that preserves bacon's natural aromas and essential oils. 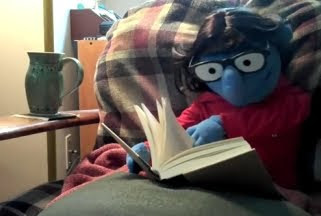 A guy who has been a Muppet fan all of his life got custom Muppets made that resembled him and his girlfriend Sara and produced a film about them. It got shown along with the other trailers at a theatre he took Sara to. When you're in the Air Force, tobogganing can be a lot more fun. You don't even need a hill! I think our Christmas tree cost something like $150. I could be overestimating, I'm not sure. In Abu Dhabi, they don't mess around. They have a tree worth $11 million. It comes with gold ornaments and gem-studded bows. You'll find it at the Emirates Palace hotel, which boasts a vending machine that pops out small gold bars. 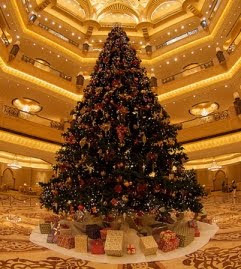 The 13 metre (43 foot) fake fir tree has 131 ornaments that include gold and precious stones such as diamonds and sapphires. This could be the new world's most expensive Christmas tree. In case this seems odd, in fact Christmas spirit is not rare in the United Arab Emirates, which although it is officially Muslim, it hosts a huge foreign population. 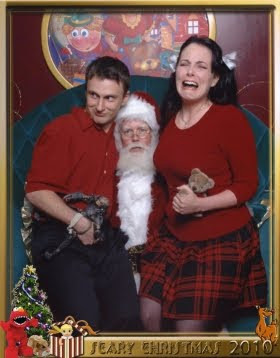 Malls are full of carollers, Santas and piped-in yuletide songs. Needless to say, the more conventional rulers of the land aren't that cozy to this display of Western tradition. * More musicians are making money off their music now then at any point in history. * The cost of buying music has gotten lower but the amount of money going into the artist's pocket has increased. * There are more people listening, sharing, buying, monetizing, stealing and engaging with music than at any other point in history. * There are more ways for an artist to get heard, become famous and make a living off their music now than at any point in the history of this planet. * Technology has made it possible for any artist to get distribution, to get discovered, to pursue his/her dreams with no company or person out there making the editorial decision that they are not allowed "in". * The majority of music now being created and distributed is happening outside of the "traditional" system. Hover hands refers to the phenomenon when nerds have their picture taken with a woman. For some reason, they feel uncomfortable touching the woman and you end up with hover hands. The Canadian government is offering the idea of a separate, pooled, private pension plan "in a bid to encourage more Canadians to save for retirement". Am I the only one scratching my head here? We already have a pension plan - two of them actually - they're called the Canada Pension Plan or CPP and Old Age Security. They're both broken. They don't offer Canadians the kind of money they need to retire comfortably. If you do manage to save up your own nest egg, or earn another pension from another source (note the word 'earn' there), the government claws back some of the pension money you'd be entitled to. My thoughts are simple. Stop side-stepping the real issue and fix the existing pension vehicles that hard working Canadians pay into their whole lives, but barely get to withdraw from when it's time to reap the benefits of the pension(s). Stop finding excuses why Canadians can't reap what they're owed because they happen to have income from various sources. It doesn't make sense and it penalizes people who go the extra mile to set aside even more of their money - no more claw-backs. It will require that the funds are managed better, that the pension funds are not lumped in with general tax revenue and that our contributions will have to go up. But wouldn't you be willing to pay a little more if it meant being able to depend on the investment to live a comfortable life in your twilight years? Creating a separate, opt-in, privately managed pension solves nothing. All it does is set the stage either for the dismantling of the CPP, or at the very least takes the heat off of the government to actual try and fix the CPP. Meanwhile, the private corporations likely to manage this new fund are drooling with anticipation. I wish I could manage my own funds going to the government. Let me pool my Employment Insurance (EI) and pension contributions and add extra if I want to and when I can afford it (tax free). The next time I'm in London, I think I'm going to visit the Hoxton Street Monster Supplies store. Here you can find things like tinned fears, human preserves, organ marmalade and the pictured item - thickest human snot! As it says on the jar, "The ultimate delicacy at any self-respecting monster's table. Our free range snivelling humans are fed a diet of milk and misery for the very thickest snot." 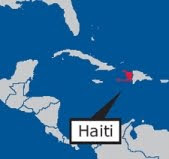 In a hilariously outrageous turn of events, Canada, Mexico and the US basically told Haiti "The international community cannot do everything in Haiti..."
Where I take an actual news headline from today and add my own flavour to the end (in italics). I found some of today's headlines lent themselves to witty rebuttals. Ontario, Maritimes hit by wild weather. Mother Nature refuses to comment. Eats cookie. Senate committee eyes penny's future. Thousands of children's piggy banks cashed in at banks today. Vancouver gang violence blamed on power vacuum. James Dyson insists no involvement. Roomba mod kits selling like hotcakes. RCMP overreacted, Bay Bulls neighbour says. Mountie slams fist on desk, throws coffee cup at reporter. Disabled musicians get royal wedding gigs. They may be deaf, but they still have rhythm. Voyager nears edge of solar system. Voyager's mom demands it get away from the edge. Grounding imminent. More US teens smoking pot. Hashish dealers up in arms. Jeopardy champs to compete versus computer. Computer, cocky, downgrades to Windows XP. Children's vitamins made false claims. Claim vitamins will take 3 inches off your waist in 4 weeks! Tories name new integrity commissioner. They name him 'person who has job in name only'. Hugh Jackman hurt in Oprah taping down under. Falls off couch while jumping. Shooting out a train window at 210 frames per second, then playing it back at 30 frames per second. I had to watch this a few times, it was so mesmerizing. If you don't feel that Canadian internet service providers should be charging via usage-based billing rather than the current flat fee, there's a petition you should sign. 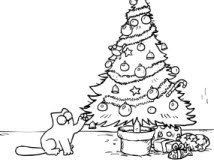 There's a new Simon's Cat video out just in time for the holidays. The creator of these shorts has it so freaking spot on. Enjoy it full screen for maximum effect. There is an 'i' in team! Cycling in winter good idea or bad? This post should get some reaction from the cyclists who pass by this blog. 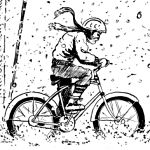 So my question is - should cyclists be riding their bikes in winter? I'm not talking about when the roads are clear but when it's down and dirty, blizzardy, poor road conditions winter. Naturally, I have some thoughts on the matter. Let me start out front by saying I have nothing but admiration and envy for bike riders. They do us all a favour in so many ways. My only problem with bike riders has ever been that some riders can't seem to make up their mind whether they want to be treated like pedestrians or vehicles. My feelings have always been you have to be one or the other, but not both. But back to the main question. The goal I have as the defensive driver of a vehicle is trying to avoid accidents. When the roads are covered with snow and ice, the job of accident avoidance is difficult enough dodging errant truck and car drivers who don't know how to adjust to winter driving. The logical solution is of course to put more stopping / veering distance between you and the other vehicles on the road. That way, you have both the time and space to stop when obstacles enter your path. Enter the bike. When the roads are in great shape, I sometimes have issues dodging bikes that unexpectedly dart in front of me, but I can easily avoid them under normal circumstances. When the roads are covered in ice and snow, not only am I having some increased difficulty maintaining control of my vehicle, but the cyclists are barely in control of their rides and because they can change direction very quickly and unexpectedly, avoiding them becomes damned near impossible. I've witnessed bikes lose control right in front of me (or worse, beside me) and almost slip right under my wheels or someone else's. Maybe I'm being selfish, but I think we could do without this kind of hazard on already treacherous winter roads. If you want to ride on a pathway or bike lane (the latter practically non-existent in winter), that's alright. But stay off the road. Sure, you've heard of wikileaks, where the scandalous secrets of the modern world are splayed out for public view. But what about the Star Wars universe? Where would you go to find out about secrets from that reality? 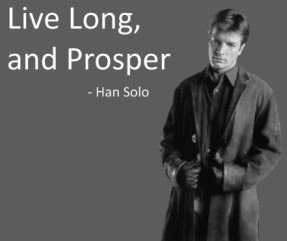 Think about it...... and....... wookieleaks, of course! For a little while the #wookieleaks tag on Twitter has been the source of many such secrets from the Star Wars universe. blastr has a list of some of the juiciest revelations. It had to be made by a cat food company (of course), but at least they're starting to make relevant media these days, like this totally awesome video called Cat Diaries, with video captured entirely by cat-cams. The editing is superb. If you're into skulls, skull-a-day blog will satisfy. You need to seriously go right into the archives back to day one (June 2007) and start there for the numerous media he uses to create skulls and find them in their not-so-native habitat. 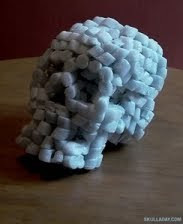 Bonus: In the archives for Dec 2010, look for the link to the video 365 skulls in 1 minute. I used to be in the military, which means I used to perform drill. You know - marching up and down the parade square and all that good stuff? So when I saw the beginning of this video, I'm all like "Pffft! That's not hard. I used to march like that all the time." Then I got to the 1:50 mark and I'm all like "Oh no they didn't!" But oh yes, they did. Then they did it backwards. Then running. So now I'm all like "OK, these guys are good". One of the reasons (yeah I know, I'll use it as a reason but I really bought it for me) I bought my iPad is because I wanted to introduce my grand-daughter to computing with it. I mean seriously - what an introduction! But no sooner did I buy it when I realized this delicate gadget was at terrible risk in her hands and I lost a little blood in my face. After all, the device is not cheap. So I looked around at what iPad protection offerings there were and kept coming back to the Otterbox brand. I knew it would be overkill, but their Defender case looked like the perfect solution that would let me rest easier with the iPad in Olivia's unforgiving grasp. I couldn't find anywhere local that sold it, so off to eBay I went. Got a great deal at $60 and cheap delivery. This case was much thicker and heavier than I had imagined, but it certainly adds the perfect feeling of ruggedness that I was looking for. It's a clever set. One part of the cover is meant to be permanent, with a removable section for the data connector port. But the 'extra' cover clasps either onto the back or the front to cover the screen for maximum protection. This extra cover also doubles as a prop stand for the iPad and has rubber feet to make the iPad slip-free on most surfaces. More snow on the way for Southern Ontario. Army nowhere in sight. Carbon-rich planet may have diamond core. All female crew set to launch next year. Crosby, Pens outclass Leafs. Biggest understatement of the year. Harper turns Piano Man drops speech for song, rocking at Tories holiday party. The PM has left the building. Elderly woman defends house with pitchfork. Tells family they'll be eating ham steaks for several weeks. Music may ease stress for ICU patients. Celine Dion banned from playlist. Bank gouging must end: consumer group. Ominous laughter heard from Bay Street in Toronto. Phone scam warns of Microsoft virus. Microsoft scam warns of phone virus. Prince Charles's car kicked in tuition riot. 007 nowhere to be found. Economic inequality breeds social ills: author. 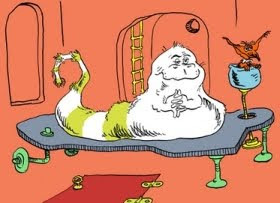 He said, from his penthouse suite at the Four Seasons Hotel. East is West, left is right and Toronto elected a loopy Conservative mayor while Calgary elected a very progressive fiscal conservative. Meanwhile, back in Toronto, the new guy Rob Ford picks Don 'I says it likes I sees it' Cherry to swear him in after a rousing speech, where he addressed Toronto city council as a group infiltrated by "Pinko lefties who ride bikes and everything". The so-called Pinko Lefties didn't take too kindly to that remark, but showed their solidarity by showing up to council today wearing various shades of pink. 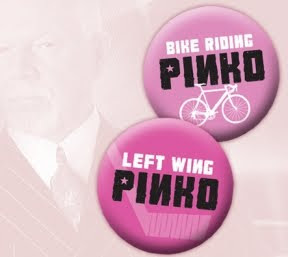 Meanwhile, buttons proclaiming Left Wing Pinko are going to sell like hotcakes.